Most water heaters last 10 to 15 years and tend to deteriorate over time. The combination of hot and cold temperatures and the frequent use of the water heater make it a vulnerable appliance that must be checked periodically. If the water heater is old and rusty, consider replacing it before it fails. It is recommended that water heaters be installed in the lowest level of the home to prevent serious water damage if they fail. If you have a natural gas water heater, be sure to check that the exhaust vent and shield are well attached and functioning properly. Inspect the tank periodically. Search for wet spots on the floor and rust on the tank. Rust will promote failures to your water heater. If you detect leaks and wet spots, this is a sign of a problem. Fix small leaks before they become a potential for a serious damage. Once in every few months, clean your tank and remove the sediment from the bottom of the tank. To do that, drain a portion of the tank following the manufacturer's instructions. The bottom drain valve must be inspected routinely and repaired if any leaks are visible. Check both inlet and outlet pipes. If you find evidence of a leak, turn off the water and power supply and hire a professional for immediate repairs. If the plumbing system is installed in the walls, consider periodically using infrared thermography to inspect the hidden plumbing and assure that no damage is occurring. Make sure that your water heater is located next to a floor drain to assure fast and simple drainage if it leaks. If installed elsewhere, install the water heater inside a drain and connect the drain pan to the floor drain. Rust or corrosion will promote leaks in the bottom drain valve. A detailed inspection of the area around the tank and routine cleanouts will extremely reduce the chances for failures. Drain the water heater tank and remove sediment periodically. Install heaters in the lowest level of the home. Check both inlet and outlet pipes. 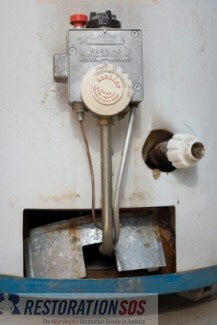 Check your water heater for leaks, rust and corrosion.